Ocean Alexander is set to debut the second yacht in its Revolution series later this year. The 25.45 metre 84 Revolution follows on from the 27 metre 90 Revolution, which had its world debut at the 2018 Fort Lauderdale International Boat Show. 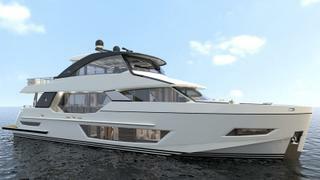 The 84R is also set to make its debut in Fort Lauderdale later this year. The model, which is available in open and enclosed layouts, has been designed by Evan K Marshall, who also designed the OA90. Key design details include large windows and numerous seating areas for entertaining set across three decks. The skylounge and flybridge each feature seating areas, a wet bar and a custom-made grill. A plunge pool meanwhile sits at the bow. Inside, “exotic wood panels” disguise the yacht’s spacious storage space, an open galley looks out onto a dining table and the master stateroom is accompanied by a stone clad master head. Accommodation is for a total of eight guests. The yacht’s vertical bow meanwhile will “expand” the interior living space, the yard said. The 84R will have a beam of 6.29 metres and will be fitted with twin Man V12 1650hp engines, though a top speed has not yet been revealed.